We have been the pioneers of DHD Hammers and Bits in the business captivated as producers and exporters of Button Bits situated in India. 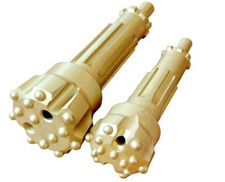 We make utilization of just the best quality materials really taking shape of these DHD Hammers and Bits that gives us a chance to offer our customers with an immaculate extent of high performing Button Bits. Throughout the assembling procedure of the Button Bits, the combination steel experiences the radio realistic and ultrasonic tests after which the items are high temperature treated in the most praiseworthy and most recent routines in our state of the craft producing unit. These DHD Hammers and Bits are acknowledged amongst our universal and national clients for their higher entrance rate and for negligible wear and tear which is owing to their reduced structure and decreased number of parts. Our DHD Hammers and Bits have been exceptionally acclaimed by our clients for their being in adaptation to the worldwide benchmarks and in accordance with the strict quality control routines. We reliably attempt to enhance these Button Bits with adjustment of the most praiseworthy and most recent assembling advances and that they generally guarantee of sheltered and dependable operations. In accordance with customers' variegated necessities, we are putting forth a radiant quality extent of DHD Hammers and, DHD 380. The offered extent is extensively utilized as a part of different commercial enterprises. Produced using fine quality material the offered pole emerges in this exceedingly aggressive industry. With a specific end goal to guarantee the quality and solidness of the item, the whole extend is tried on decently characterized parameters before the last conveyance at the customers end. Customers can benefit the whole extend from us in different sizes and measurements at business heading costs.